Natural Beauty by fundamental change. Rejuran contains polynucleotide (PN or PDRN), a biological molecules present in DNA of all living things. The PDRN helps our cells to repair, regenerate and revitalize. Rejuran’s PDRN is extracted from salmon sperm cells because salmon DNA is highly compatible with human cells without causing allergic or reaction. What is so good about Rejuran? 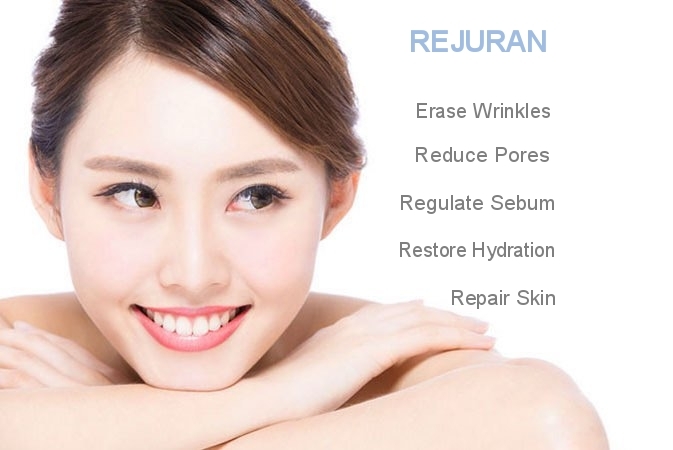 Different from other skin anti-aging treatment, Rejuran promotes self-recovery from within. Rejuran activates self-regeneration of the cells as well as recover protective layers of skin. This keeps the skin healthy and youthful naturally. This is also excellent for acne scars recovery. Promotes Skin Matrix and collagen restoration. Anti-aging effects: Improve wrinkles, volume and lifting effect. Recovery of Skin Balance from inside. Reduce sebum secretion, promote skin hydration, minimize pores and clarify skin tone. Rejuran is clinically proven to improve skin thickness and reduce wrinkles 4 weeks after the administration even in very sensitive around the eyes and under eyes areas. What is the benefit of Rejuran Healer? How is Rejuran different from other skin booster? Skin booster which contains Hyaluronic Acid hydrates up to the deepest layer of the skin cells and giving an instant and lasting radiant effect. Examples: Restylane and Juvederm. Some skin booster contains Hyaluronic acid as well as other nutrients, Minerals, Vitamins and Peptides which not only hydrate the skin but nourish the skin from deep within giving an instant glowing, smooth and refined skin texture within minutes. Example: Redensity 1. Rejuran promotes skin repair and recovery, therefore giving a natural anti-aging effect and healthy skin with balanced sebum and hydration secretion. The conclusion is different skin boosters have different mechanism and effect. Combination treatment will produce comprehensive and more remarkable results. How frequent do I need to receive this treatment? Rejuran recovers skin back to normal with total of 4 treatments with 2 to 3 weeks interval and repeated treatment every 6 months to maintaining a healthy skin condition. Which part of skin will benefit the most from this treatment? Rejuran is proven effective for face, neck and hands even for very sensitive skin areas such as around eyes, under eyes, neck lines, back of hands, etc. When can I return to daily life? There might be small ‘bumps’ around the needle points which will subside within 24 hours.